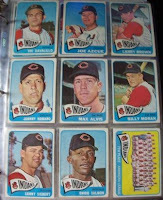 In 1965, Topps produced a base set with a few insert sets to go with it. 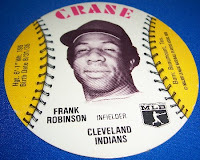 The base set included cards with a white "pennant" shape eith the Indians team name in it. One of the insert sets was the gold embossed cards, which are blue with gold foil pictures and borders. The first time I saw one of the embossed varieties, I had no idea what it was (other than the T.C.G. on the back). In fact, I am pretty sure that the 1965 Embossed was the reason I bought my first price guide. I didn't care about the "value" of the card, I wanted to know what it was! And, back in those days (somewhere in the early 80's), the World Wide Web was no where to be seen. With guide in hand, I found the matching picture and couldn't wait to get the rest of the Indians from that set! I have since obtained each of the Indians cards of that set and now have all but 1 card (though, I believe I recently ordered it from the Beckett Marketplace) in the set. The first time I saw a game-used card, I was awestruck, as if I were a kid seeing a card for the first time. Being the sort who likes to take things apart and put them back together again, I understood the "how" of the game-used card. What got me was the fact that someone had even thought to include a piece of the actual bat used by one of the players I enjoyed watching! 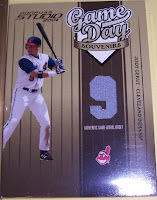 I am a H-U-G-E Jim Thome fan, and my first game-used card was the "Moments and Milestones" Bat card (shown). This was all of just a few years ago. I remember showing to my Dad, as if I were twelve years old. 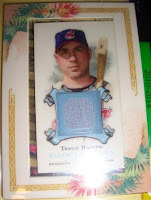 Since that first card, I have added many game-used cards to my collection - jerseys, bats, even pants. The "problem" I have with game-used cards nowadays is that the novelty has worn off. Card companies started producing so many of them that, for me anyway, they have lost some of the luster, the awe, that they first generated in me. Regardless of what one may think or feel about the card companies putting clothing and other materials in (or on) cards, for me, it is like being one step closer to the game, to the players. 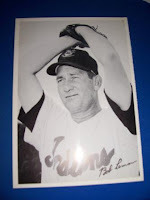 I (and some serial-numbered of other folks) own a piece of this player's jersey (or bat, pants, glove, etc)!! I will say that I am not a big fan of "dirt" cards and/or "base" cards. 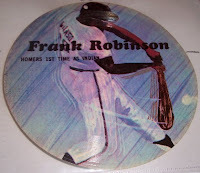 I guess if I had some connection (say, since I am originally from Pittsburgh, a card with Three-Rivers Stadium dirt), perhaps I would wax nostalgia and want a piece of the stadium, but for the life of me, I just can't find that place within myself. A piece of home plate? First base?? Or a stadium seat even? Nah, I guess I am missing that particular collector's gene that says, "collect anything and everything!" Note: The checklists I provide are accurate so far as I have determined. Checklists do *NOT* necessarily indicate the cards I have in my collection. Checklists are provided so that collectors will know which cards are in which sets. You may be wondering why, of all the cards I have, I start my posting with the 1993 ProCards Kinston Indians. Well, it's simple. I happen to be entering the team set into my database and thought, "Hey, I'll post this checklist." No one said I was brilliant, okay? 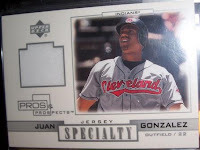 Greetings and welcome to the place where I'll talk about Indians baseball cards. Why? Because that's what I collect. Starting with my first card in 1975, my collection has amassed nearly 6000 non-duplicated singles, and grows every single day. 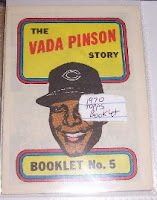 I hope to use this spot on the Web to share images, checklists, and thoughts about various Indians baseball cards! make yourself at home, and enjoy the ride! 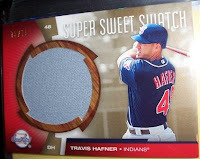 Pictured below is my first purchased Indians card. The crease across the card came from one of my "stupid" moments in life. I had a stack of cards wrapped with a rubber band. This card was on top. One slip of the hand, and POW, instant crease. I have kept the card after all these years because, despite its flaw, it is my favorite - my first bought one. 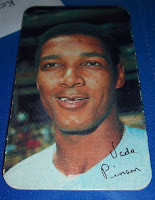 I paid 25 cents for it in 1975, and have been buying Indians cards ever since.